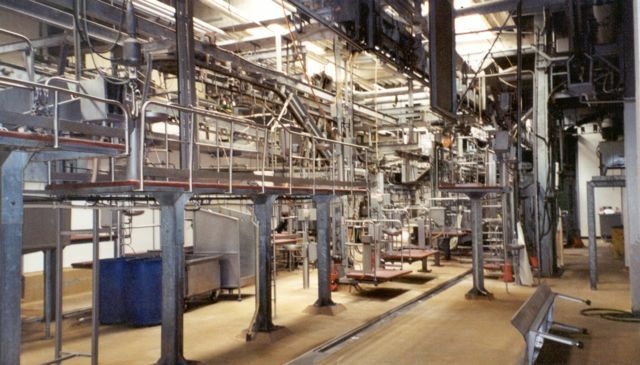 The "abattoir's" equipment and facilities are the most modern ones of their kind. Nowadays, the abattoir still has two slaughter lines (since 1984); one for pigs and one for large animals (cows, horses, calves, sheep and deer). Each year, about 230,000 animals are slaughtered here, approximately 2 to 3 % of all animals slaughtered in Belgium (in comparison with 14% in 1934). Ritual slaughter also takes place at the site. In fact, this is what it all started with: the trading and butchering of animals, and the boning and selling of quality meat. More than a century later, the “abattoir of Anderlecht”, as it is popularly known, has grown into a centre where more than forty experienced specialists, who have become one with their trade, can be found under one roof. The slaughter lines and the butcher’s equipment are continuously renewed and modernized, often at the cost of substantial additional investments. Hygiene rules are very strict too, and subject to frequent controls. "And pigs might fly", the saying goes. Be sure, here they do not! Allow us to make one thing clear once and for all: we do respect animals as much as we do respect any other living being. Maybe that is why we control the circumstances in which they have been grown, the quality and circumstances under which they got fed, as well as the way in which they were transported and over what distance, ... Once the animals are here, they are being treated in the most correct way as possible. Pigs are being kept separate from all other cattle, and be sure, we do have our good reasons for doing so. The slaughtering of pigs is a "wet process". When slaughtered, the animals take a 62° C hot tub to soak the hairy skin, to burn and brush it afterwards). Pigs are not skinned, you should know. That's why such a process. Should there not be a complete separation of this process from the others animals, watersteam coming from the pigs' slaughterline could contaminate the cows' carcasses. All these operations alltogether take 80% of the total slaughter surface. The rest of the process is pretty similar to that of the other cattle treated here, with this particular distinction that all other cattle is skinned as soon as slaughtered. The size of the animals too makes that the tools used are quite different. Should you want to get in touch with either slaughter, click here.